Don't miss this once-in-a-lifetime event! A once-in-a-lifetime Jam for Peace will feature members of some of the San Francisco’s most iconic rock bands, including Big Brother and the Holding Company, Country Joe and the Fish, The Blues Project, Sons of Champlin, Electric Flag, Stoneground and The Youngbloods. Video messages of peace from Peter Coyote, Paul McCartney, Ringo Starr, Michelle Phillips, Dr. Jane Goodall, Kenny Loggins, Joe Walsh, Tavis Smiley, Edward James Olmos, Linda Gray, Ed Asner, Olympian Marilyn King and other luminaries. Contemporary electronic-world fusion band House of Hamsa and cutting edge electronic music DJs Andreilien and Feral will also perform at the cross-generational event. 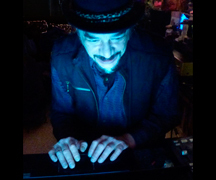 There will be visual light shows by Stefan G and Dr. Paradise, and projections of historic film footage of the 1967 Human Be-In and Summer of Love. Speakers include Grateful Dead publicist and author Dennis McNally, Grateful Dead lyricist and EFF co-founder John Perry Barlow, Beat Museum founder Jerry Cimino, Pathways to Peace founder Avon Mattison, Adil Kassam of Unify,com, Mikey Siegel of Consciousness Hacking, cannabis pioneers Nikki Lastreto and Swami Chaitanya, Unity Foundation director Bill McCarthey, Digital Be-In founder Michael Gosney and many others. Virtual Reality demos include the U.N.'s “Clouds Over Sidra” Syrian refugee camp, and the Stanford Ocean Acidification Experience, which takes viewers to the bottom of the sea then fast-forwards to the end of the century. 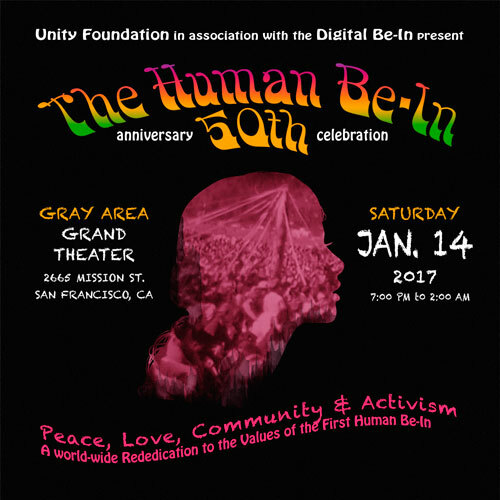 THe Human Be-In 50th Anniversary Celebration will be held at the state-of-the-art event space in San Francisco's Mission District, the Gray Area/Grand Theater.